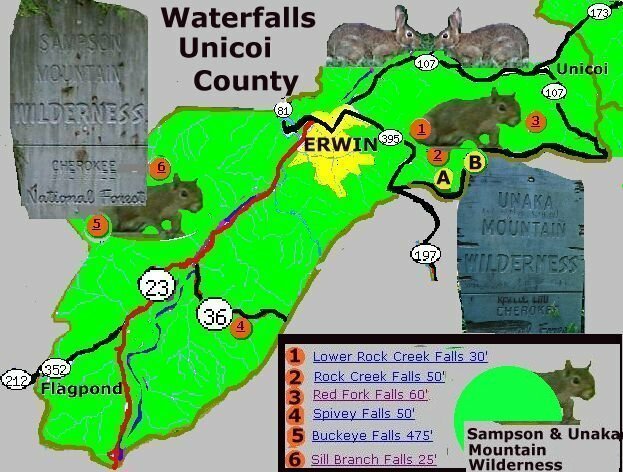 Water Falls in the General Area Around the towns and communities of Unicoi county include Flag Pond, Erwin (county seat), and Unicoi, Tennessee. None of the waterfalls have been accurately measured. Approximate locations are shown on the accompanying map. This is a list of waterfalls in Unicoi county and Flagpond Tennessee that I know about. Every waterfall in this list includes as much information as I know. If you know more about a particular waterfall or know of a waterfall not on this list, please let me know.